A Cameroon holiday is quite colorful and lively. Imagine a diverse group of over 250 fun-loving and energetic ethnic groups gathering together nationwide, each in their cultural manner, to celebrate one holiday. 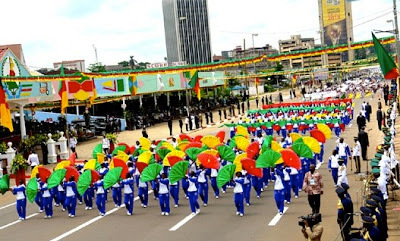 On Cameroon national holidays and public holidays the entire nation is feasting - all daylong parades at strategic grand stands allover the nation, an afternoon of public, state and local dinners. You get to feel the national spirit on these occasions, even as a tourist. Cameroon's religious holidays are not less colorful either - a full morning of people dressed in various traditional attires going to churches or mosques for sermons and prayers. Sharing with strangers, love ones and neighbors is a great feature of holidays in Cameroon. Although not having much, everyone is eager to share whatever they have with others especially those of a different faith as they are all invited to share in the celebrations. Listed below are holidays in Cameroon. Businesses - schools, banks, government offices are all closed on these days. Please plan you business activities accordingly. Keep in mind that religious holidays of Cameroon are not fix and rotate yearly based on the religion's calendar. For these an estimated date is given.